Climate change. Those two words will determine the health of the planet and the people she houses in the next 100 years. Not a single area of life will be the same 100 years from now, and climate change will be the reason. The economic effects of climate change will be greater than all of the recession, depression, and inflation cycles this country has ever seen. Actually, you do need to worry about it. Or, at the very least, notice it. Because climate change is more than theory and nearer than a century away. It is demonstrably here right now. Gildshire and any other reputable science news magazine online are covering this important story. Perhaps surprisingly, not every one of the economic effects of climate change is bad. We knew that would be the case and it is showing up in some agricultural statistics in some surprising places. That said, climate change is, on balance, a pretty bad deal for most of the planet. Here is a breakdown of the impact it is having today in the United States. You can follow along on the map above. The National Oceanic and Atmospheric Administration helped us with the research. The Pacific Northwest is experiencing a decreased shellfish harvest due to warming ocean temperatures. The shells are coming in thinner and the fish beneath the shell isn’t able to withstand the rigors of ocean life. However, and this is one of the positive outcomes of climate change we discussed earlier, western Oregon is seeing increased agricultural harvests. Warmer springs and falls are lengthening the growing season in this, traditionally cool and rainy, area. Our friends in California, however, don’t have it so good. A phenomenon known to scientists as “whipsaw water supply” is affecting the Golden State. That means periods of severe drought followed by years of excessive rain. Back and forth, rinse and repeat. Increased demand for electricity plagues the entire southern tier of states. Tucson to Houston to Biloxi to Tallahassee. There was a time folks in those cities went months without firing up the air conditioner. Not so much, anymore. Is this just one of several economic effects of climate change? It’s actually worse than that. More than at any time in the last 100 years, people are dying from the heat in Arizona, Texas, and Mississippi. Perhaps a move north is in their future because decreased cold-related mortality is taking place in northern Illinois, Wisconsin, and Minnesota. Warmer winter temps are keeping those folks alive. Decreased agricultural yields are taking place throughout the Plains states. The crops need periods of cool weather that they simply aren’t receiving. We already know that increased wildfire activity from California up through Montana is playing havoc with both the ground cover and the canopy. 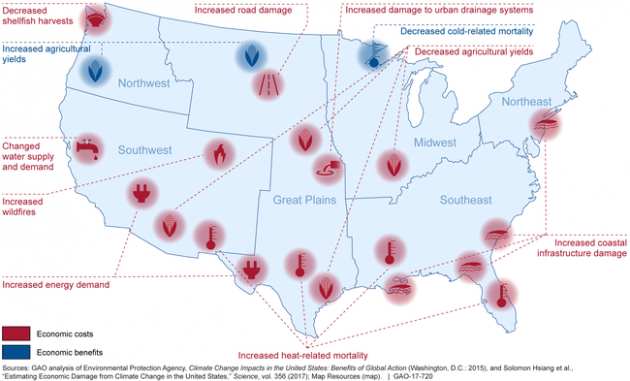 Expect those to increase and the economic effects of climate change to pale compared to the hazardous conditions causing injury and loss of life to wildfires. Coastal storms in the east are becoming stronger and more sustained. Folks who chose to live in Florida knew the risks incumbent in their choice of residence. South Carolinians knew, as well. Pity the people in Delaware and New Jersey who had no idea they were about to become an expanded Hurricane Alley. Coastal infrastructure damage in the tens of millions is no longer “Once in a hundred year”, phenomena. Expect that, annually. Have you ever wanted to own a farm in North Dakota? Well, this is the best time ever for such an undertaking. Warmer annual temperatures are making arable what was once virtual permafrost. So what is our point, other than to ruin your afternoon tea break? Well, we believe that with knowledge comes power and with power comes change. Climate change isn’t just something for the dusty future that our grandchildren will blame us for allowing. (My apologies to Ava. I should have been better.) It is an issue today! It is time for us to know what, deep down, we already knew. Consider this a call to action. Your favorite science news magazine online knows we can, together, turn this thing around.